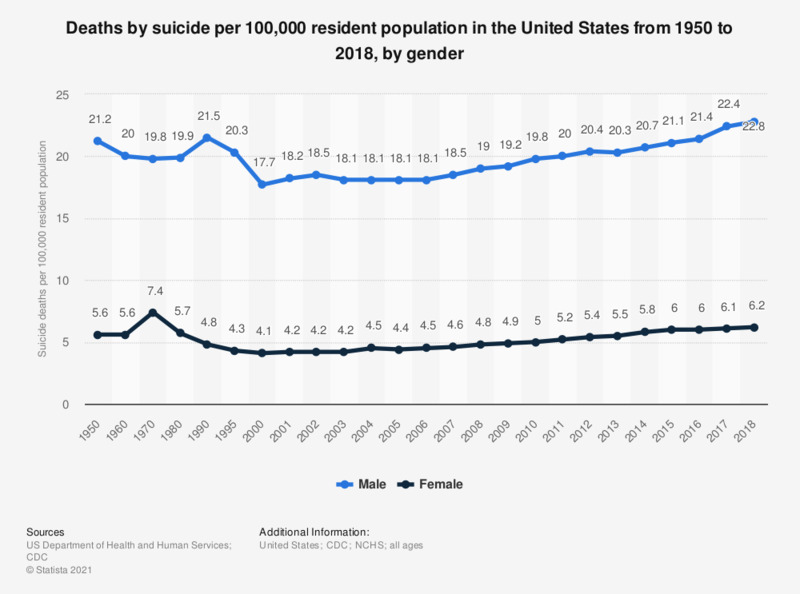 This statistic shows the death rate for suicide in the United States from 1950 to 2016, by gender. In 2016, there were 21.4 male and 6 female deaths by suicide per 100,000 resident population in the United States. From 1950 to 2016 the death rate from suicide for males was consistently higher than that of females. In total, the death rate from suicide in the U.S. since 1950 has fluctuated throughout the years, but remains virtually unchanged. In 1950, the overall death rate for suicide per 100,000 residents was 13.2 and in 2016 was reported to be 13.5. More specifically, the state of Montana had the highest suicide rate in the U.S. in 2016 with 26 suicides per 100,000 residents. Montana was followed by Alaska with 25.4 and Wyoming with 25.2. According to figures from the year 2016, those aged 45 to 64 were the most likely age group to die by suicide. Statistics concerning the death rate from suicide in the U.S. by age show that those 45 to 64 years of age experienced a rate of 19.2 deaths by suicide per 100,000 residents in 2016. The rate for those 65 years and over during this time was found to be 16.7 and those 25 to 44 years of age saw a rate of 16.9. All rates are age-adjusted.Age-adjusted rates are calculated using the year 2000 standard population. Prior to 2001, age-adjusted rates were calculated using standard million proportions based on rounded population numbers. Starting with 2001 data, unrounded population numbers are used to calculate age-adjusted rates.